DPS PhotoWalk in Las Vegas - Interested? DPS PhotoWalk in Las Vegas – Interested? Are you interested in coming on a DPS photowalk in Las Vegas later this month? A number of our members have organized their own photowalks before amongst themselves but seeing as a number of regular DPS members will all be in Las Vegas between 19-21 September for BlogWorldExpo we thought it might be a good time to get together and do an official DPS photowalk (don’t know what a photowalk is – check out our mini tutorial on how to do one). Basically it’ll be a bunch of photographers (beginners through to more advanced ones) getting together to go on a walk through Vegas with their cameras. Time for fun, connecting, perhaps a little informal learning from one another. It’ll be open to anyone who wants to tag along whether they have a pro DSLR or a point and shoot. I’ve already had interest from one company that is willing to put together some lenses for those who show up to try out on the day which will make it all the more fun. What this post is about however is to see if anyone is interested and if so – how many? If you’re going to be in town for Blog World Expo or you live in the Vegas area and this interests you – please leave a comment below. Please include your valid email address in the email field (it won’t be made public) so that I can keep you up to date on whether this actually happens and what the details are. The emails won’t be used for any other purpose than organizing the walk. For those unable to come – we’ll find a way to share the shots taken (probably by tagging them all the same thing on Flickr) so you can live vicariously through our images. I’m not sure which day or what time it’ll be held yet or even who will lead us (this will be my first time to Vegas so I might not be the guy – if you’re a local let us know below) but it should be a fun couple of hours! More details to follow. If there is another, I would join that one! Totally interested !!! Live in Vegas, love DPS, and just saw the walk... Thanks !!! 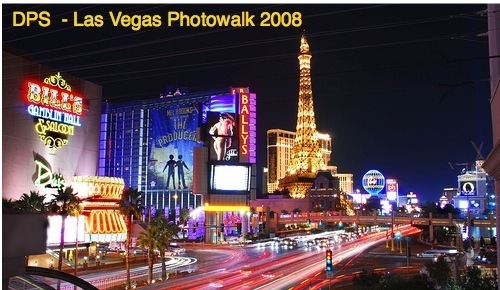 I live in Las Vegas, I would love to join to phtowalk, please put my name in your list. Thank you!!!! please put my name in your list. Thank you!!!!! I have posted earlier and am very interested in joining the photowalk group. I haven't heard back as to any plans of when and where this will take place. I am leaving on Wednesday and will be there in Vegas until Saturday. I would like to know more information of where we would meet, how long we will be on this walk etc. This will be a first for me and would love to attend. Please email back with info soon. I posted a reply a couple of days ago indicating my interest in participating in the Las Vegas photo tour, but haven't had an email from you. Since I responded from my PDA and not my computer, I feared that something went wrong. Therefore, I'm replying again. I am very interested in joining you in Las Vegas. Hi, would love to come,if in town...keep me posted.. I've lived in Las Vegas for 25 years. Would love to join the walk to see my city through the eyes of so many talented photographers. Would love more info., to see if I can work it in to my schedule. Add me to the list. I'll be at BlogWorld, and would love to make the walk. I grew up in Henderson. I'll be getting married in Vegas on the 20th. I'll be there on the 19th. If I get a chance I'd love to join the crowd. I was just there 2 weeeks ago and all who go will have plenty of sujects to shoot while there from people to the Strip at night. Look to photograph some old Vegas signs such as old motel, wedding chapel signs etc. I like to ride the "Deuce" bus and try to ride on the 2nd level at front window. You can get some good shots of signs and casino buildings. If you do this try to get on the bus from about the Mandalay hotel stop and head north. The bus takes you to old Vegas. The bus ticket only costs $5.00 to ride for 24 hours. Be sure to shoot plenty of night photos. Sounds like fun. Count me in as well. I would love to attend, I am from out of town, but will be in Vegas around that time. Sounds like a lot of fun and learning, Count me in!!! I would love to attend BlogWorld and would love to join you for the Photowalk. Please include me in your mailing. Sounds like a great time - I'll be there. Oh, man, way to pick a busy weekend! I'd like to come along if I can squeeze in some time. Get cracking on the plans, guys! Count me in! Depending on the specific day & time, I would fly in from Phoenix. Please add me to your mailing list. I think Aaron has me down as interested ... but just to make it official. I will just happen to be in Vegas during the time of the photo walk. Please send me info when everything is finalized. I'll be attending BWE and I'd love to be included in the photo walk. Great idea Darren! I'm a local and very interested in a Photowalk of the Las Vegas strip. Can't wait to have fun!!! Would love to join the walk. I'm a local and need to learn how to better use my Rebel. I am very much interested! Please count me in. I am in St. George and would like to take part. I'm local and won't be tripping around the country then, so count me in! Count me in! Arriving in Vegas for BlogWorld on 9/18. Vegas is a fun place to take pictures - day or night. Looking forward to meeting other bloggers/photographers! That sounds fabulous. I live in the Bay Area, California so Vegas isn't too far away :) Don't know if I can make it for sure but please keep me updated!!! I'd be interested. I'm no advanced photographer and only have a Canon G9. I'm also a Vegas local and have lived her for 3 years now! I live in Las Vegas and I would definately love to join the photowalk! Just came back from Vegas, so I can't join but let me assure you that you should walk at night. Vegas is so much nicer when it's dark outside. i'll be intown for a wedding.. keep me updated! I'm so lucky! it just so happens I'll be there that weekend for a high school reunion. Let me know when you're planning on going, it'll be a pretty busy weekend but I'd love to go. I'll be out there September 18-20. I'd like to join if there is enough interest from everyone else. I've never done an official photowalk before. I'd be very interested if the Date and time work out. I'll be in Vegas arriving on the 17th(noonish) leaving on the 20th in the am. Please keep me informed. I will be starting my vaction in Vegas on Sept 19 before going to Grand Canyon & Sedona. Can't wait to go on this "walk"
I would love to come. I could drive down, especially if its just gonna be a day or night. It's about a six hour drive so I need to have details so that I may make my plans. My husband may have a race out there as well around that time. Keep me informed. I would love to try out different lenses. This sounds fantastic! I've been a Las Vegas resident since March, will definitely try to be there. I, too, live here in Las Vegas, and would love to join in on a photowalk! As long as it isn't on Fremont Street - I work at a hotel on Fremont Street, and that's where our photowalk for the Scott Kelby WWPW was held...anywhere else would be cool though. I live in Vegas and do my own photowalk 2-3 times a month. I'd love to get some new perspectives! AHHHHH! So jealous. I am planning a Vegas trip for October. I will have to miss this one. But, please do post all the pics. As I am looking forward to seeing the possibilities o what I will be able to do. I am attending BlogWorld and would love to join you for the Photowalk. Please include me in your mailing. This is a great little event. If only I was in Vegas around this time I would def. take advantage of this. I live in Henderson, and I was planning on going on my first Photowalk with Drew above while he is in town for BWE. He's an amazing photographer, and I'm just a point and shoot kinda gal. We'd love to tag along on this! I'm in. Keep me posted. I may be interested - keep me updated! I'm definitely interested...just got a new digital camera and will be documenting BWE for www.Sparkplugging.com - our team is being sponsored by Epson! I'll be in Vegas for Blog World Expo and would love to go on the Photowalk. I was planing to go on one with a friend of mine so we could use my GiSTEQ phototrackr around the strip. Please keep me informed with Photowalking details. I wouldn't miss this for anything! Oh Yeah! I'm ... oh, hang on, I live in London! DOH!... Have fun you lot, look forward to seeing the photos! I'm very interested in a Photowalk in Vegas... I'll be at BWE from Thursday afternoon through Tuesday afternoon. I'd LOVE to get my hands on a Nikon 12-24 to try out... I think that could be a GREAT marketing opportunity for a lens rental company! Keep us informed... this sounds exciting. Oh! I wish I had known a little earlier. My anniversary is the 19th, I could have planned a trip, and snuck away for the photowalk. I am local and would be interested in a walk. If you look at some of my photos I have done shots of locations around the strip already, but would like a more structured photowalk. I've been interested to do one for a while but now have that opportunity. I live in Vegas, so I'm definitely in! I saw your link and my sister and I will so happen to be in Las Vegas on the above mentioned dates. We are very interested to join this photowalk. Is there a fee? Where will the meet up point be? Please email me the details so we can confirm if we are going to be reserving two slots for ourselves. Thanks! i'm a local and would possibly be interested in joining up with a few people to shoot some photos. keep me updated and let me know what you guys decide! Please include me even though I only have a point and shoot! This is something I want to learn as I'm going full time blogging!